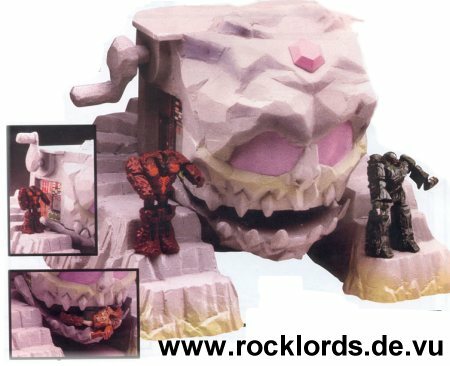 There was at least one unproduced item in the Rock Lords toyline, that is this "Stonehead" Playset, that was pictured in the Tonka 1986 catalogue. In fact, the Rock Lords toyline did not have any playsets (only the two vehicles), so this would have been a natural extension to the line. The playset seems to have had a "figure eating" mechanism, making the jaws move by hand. It is unknown how this was planned to be released (perhaps with an exclusive figure?) and what other features apart from the obvious one were thought to be included. But it is anyway a superb piece, and probably this prototype is something like the holy grail for any Rock Lords collector - yet it is unknown if it still exists.